Norvald James “Jim” Boyum, 90, of Sioux Falls passed away Wednesday morning after a brief illness. Jim was surrounded by his family at the Dougherty Hospice House. Mass of Christian Burial will be celebrated at 10:00 am on Monday, November 26 at the Cathedral of St. Joseph in Sioux Falls. Lunch will take place after the service, followed by inurnment at St. Michael’s Cemetery. Visitation with family present will begin at 3:00 pm on Sunday at St. Mary’s in Dell Rapids with a prayer service and rosary at 4:00. Jim was born in Sioux Falls, SD to Norvald and Marguerite (Beach) Boyum on January 1, 1928. He grew up with a deep love and appreciation for family with his brother Bob and his two sisters Marge and Pat. He married the love of his life, Teresa Ann Bowen, on September 26, 1946. Jim and Teresa welcomed six children into their family, Kathleen, James, Thomas, Mark, Susan and Daniel. 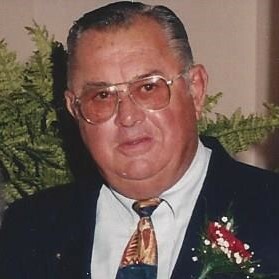 Jim loved his family, hunting, fishing, woodworking, golfing, his grandchildren, his great grandchildren, baseball, dominoes, cribbage and a nice big chunk of steak. He didn’t much care for vegetables. Jim loved life. Jim worked in the heavy equipment and truck repair and sales business his entire career, spanning nearly 50 years. From his early days at Empire Equipment and then Sheehan-Bartling and Sheehan equipment, working his way to a partner in the business until his retirement in 1984. Retirement didn’t suit Jim too well so he founded I-90 White GMC in 1985 and operated that until 1993 when he retired for good. After this second retirement, Jim and Teresa were formally inducted into the Snowbird League, wintering in Mesa for the next 12 years where they enjoyed the good life surrounded by his siblings and many friends, both old and new. Winters in Arizona and summers back here in South Dakota. In 2005 Jim and Teresa returned full time to South Dakota, moving to Dell Rapids where they resided for 12 years. In 2017 they moved to Sioux Falls, residing at Laurel Oaks Apartments at Prince of Peace. Jim and Teresa had the opportunity to travel to many wonderful places across the United States as well as to the Caribbean and throughout Europe. He also enjoyed several fishing and hunting trips to the frozen wonders of Canada. Those grateful to have shared his incredible life are wife Teresa, daughters Kathleen of Sacramento, CA and Sue (Brian) Rainey of Las Vegas, NV; sons Jim (d) (Kathy), Tom (Janet) of Canton, SD, Mark (Lora Cady) of Sioux Falls and Dan (Pam) of Renner, SD; grandchildren Gia (d), BJ (Carla), Shane, April (Ryan), Cody (Christy), Jessie (James), Jeremiah, Tressa, Dulcie, Zach (Christine), Annie, Dylan, Bowen, Max, Olivia, Eva; eighteen great-grandchildren, one great-great grandchild and many treasured nieces and nephews. He was preceded in death by his parents; sisters, Marjorie and Patricia;brother, Robert; son, Jim; and granddaughter, Gia. Jim respectfully requested no flowers. Instead, he and the family requested any memorials to be directed to the Sioux Falls Catholic School System for the benefit of tuition assistance to families of the community.